Cooking for family and friends should be a pleasure, but trying to find the time in our busy lives can make it seem like a chore. Mary Berry takes the heat out of the kitchen by showing you how to prepare everything in advance. With each delicious dish, Mary proves that convenience doesn't have to mean compromising on flavor, quality, or style. Whether you are cooking for family, a few friends, or a Christmas crowd, Cook Now, Eat Later gets you one step ahead, giving you a hassle-free mealtime. Using clear instructions, the best ingredients, and practical shortcuts, Mary's easy-to-follow recipes and tips will give you the cooking confidence you need to make entertaining a breeze. 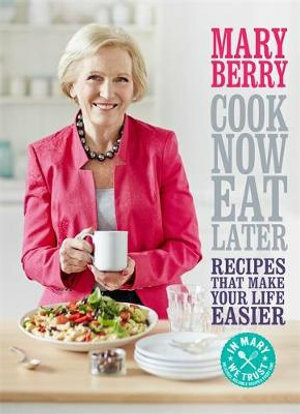 Mary Berry is the author of more than sixty cookery books, including her bestselling Aga book. She has presented several television cookery series and is a regular guest on programmes such as 'Saturday Cooks'. She contributes to radio programmes and cookery magazines, and is loved for her practical and unfussy approach to preparing and serving food. She gives many demonstrations around the country and when at home loves being with her family and tending to her lovely garden, her other great passion.